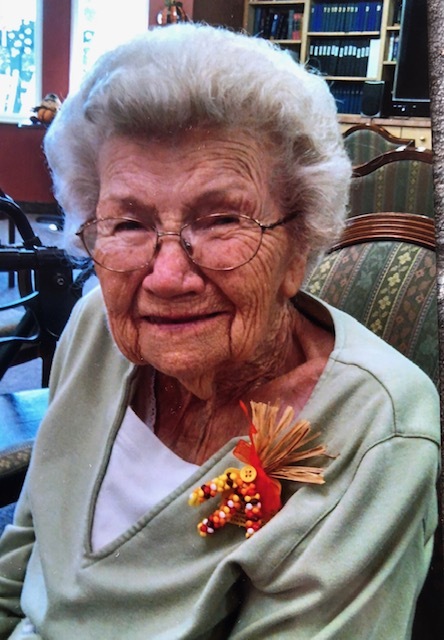 Sarah Frances Marks was born June 6, 1920 and died February 7, 2019. "Chig", as she was affectionately named by her grandfather because he said she wasn't as big as a chigger when she was born, was preceded in death by her husband, Alfred G. Marks; her son and daughter-in-law, A.G. & Donna Marks. She is survived by her son and daughter-in-law, Ronnie and Ottie Marks; her daughter and son-in-law, Gayle and Mike Byrne; three grandchildren, Greg (Jan) Marks, Nick(Cyndy) Marks, and Camille Spratling; four great grandchildren, Tad, Caleb, Madison and Amelia Marks. She was a Christian wife, mother, grandmother and great grandmother who persevered through many of life's toughest hardships with fierce determination and an unwavering positive attitude. Visitation be will held on Monday February 11th 11:00 a.m. until funeral service at 2:00 p.m. in the Partlow Funeral Chapel. Dr. Kevin Owen will officiate the service. Interment, Wilson Co. Memorial Gardens. Active pallbearers, Greg Marks, Nick Marks, Tad Marks, Caleb Marks, Jimmy McDowell, Bob Bucy, Terry McDonald & Bob Thomas. Honorary pallbearers, Eddie Callis, Jack Lowery, Owen Gentry, Al Gore & Finis Gentry. The family requests that in lieu of flowers, contributions be made to the "Betty Freeman Fund for Hearthside" at College Hills Church of Christ or your favorite charity.